I love to see my Rhema growing in her cognition and doing new things. My favorite thing that she has done lately is showing nurturing tendencies. We were between her PT sessions and she and I typically sit in the back of the van together. Rhema plays with her toys, gets to wiggle around some and I usually make phone calls and/or am working on a project. On the rare occasion I’m exhausted, I will lay down on the floor in the back and set a timer to rouse me in enough time to get her to her next session. So a few weeks ago, I got all my stuff done and decided to close my eyes for 15 minutes before her next session. I got a pillow and laid my head down on the bench near her and closed my eyes. Now, I get very little “rest” because Rhema usually is very curious as to what I’m doing and she usually crawls all over me, poking me sweetly and talking. LOL! But this last time, when I closed my eyes to steal a few moments of rest, I felt her pulling on stuff behind my back; I peeked out just in time to see her pull free a blanket and gently try to cover me. “There you go momma…you rest….” was what Rhema sweetly whispered as she attempted to blanket momma. Ya’ll, I could have cried! I think I did cry a little as I thanked her for taking such good care of momma and telling her how sweet that was to cover momma up. I was stunned when she did this; she is always extremely loving, but this was the first time she showed this nurturing side. It was a very precious moment for me. 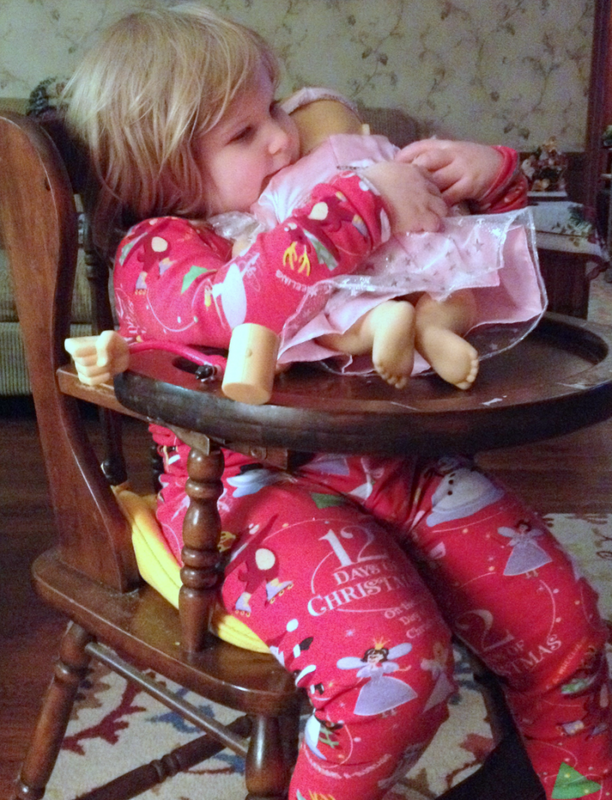 For Christmas she got this little American Girl Bitty Baby from her PapaGida and she has shown some nurturing there too! She wraps her in a blanket and will hold her up and hug her telling her, “it’s okay baby….”. It’s all very sweet to see Rhema growing in new ways! This has to be one of my favorite “growth” spurts in a long time. It’s really just so precious!! !